Jifiti, the startup attempting to reinvent digital gift-giving, announced this morning that their new chatbot API was approved by Facebook Messenger. It’s a big deal for the Columbus, OH startup, who already has relationships with many companies ranging from IKEA to Evite. This new avenue could give Jifiti access to brands lining up to be available in Facebook’s ecosystem since chatbot intentions were announced at F8 last month. You may recall that announcement in which Facebook outlined its intentions to disrupt how people communicate by offering a scalable, artificial intelligence-laden way for users to get the one-to-one info they need—conversationally—without requiring one-to-one human employees to be available for every facet of that conversation. It’s planned to be used for e-commerce, support, personal assistance and other tasks. Jifiti, who we’ve been covering since their “product teleportation” launch in 2013 (which I always thought was a neat marketing play), through their pivot to white label gift registry in 2014 are now able to integrate their gift-giving process directly with Facebook Messenger chatbots (or any chatbot actually) via this API. How Jifiti solves this problem is by creating two experiences: a gift sending experience and a gift receiving experience. 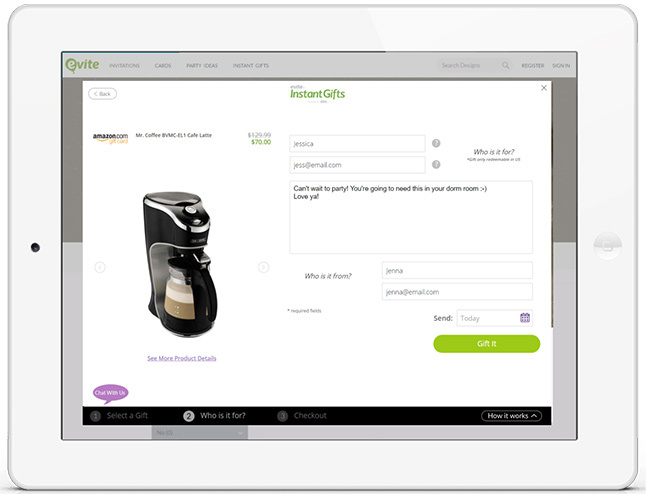 When a consumer sends a gift, they press the “gift” button at a Jifiti-partnered online merchant. This gift button is integrated into the merchant site or app with just a few lines of code. When the button is pressed, a new overlay window opens with a small form where the email address of the recipient and a note can be entered as well as scheduling info and payment for the item. This is where it gets a bit tricky. The item is not actually purchased, but rather the value of that item is generated into a gift card behind the scenes. All of this is packaged up into an email and sent to the recipient. The gift recipient gets the previously generated email message in their inbox. When they open it, there is an unboxing animation and then a link to a web or app page where the gift that was chosen for them is displayed. At this point the recipient can choose the correct size they want and then enter the address where they want it shipped. Or, if they don’t want that item, they can use the value of the gift card that came along with the gift to purchase something else. Strategically speaking, Weisband and team claim to have uncovered some of the behaviors that enable this gifting to work most successfully. Based on how he described this to me, I’m not sure I disagree. The team has found that gifting works best when there is a trigger—event or otherwise—that reminds senders to send gifts. This seems obvious, but again the team found an opportunity to streamline the process to make sending easier. Because of this insight, the company are focused on trigger-based platforms like events and gift registry experiences…hence their partnerships with Evite, 24me, and IKEA Registry among others. Their partnership and integration with these players’ calendar and event-based sites and apps already allows trigger gift recommendations via the previously described procedure to instantly gift an item while it’s all top-of-mind. Now, through their chatbot API, any brand already developing their own chatbot can easily integrate the Jifiti process. In this gifting scenario, a merchant sells the merchandise, Jifiti receives pay-on-performance gift card commission that they split with the company triggering the user to action (Evite, etc.). The sender had a quick, easy experience and the recipient gets a gift. Everybody seems to win. Jifiti also has a SaaS model for larger partnerships. What looms in the near future is to see how this all plays out within chatbot experiences as they seem poised to gain traction with Facebook’s muscle behind them. Meanwhile Jifiti is capturing much information about which items are performing well as gifts, gender, location etc. (see the infographic below) which is sure to be useful. Jifiti closed a Series A funding round of $3.3 million about 6 months ago led by Liberty Media (who interestingly owns Evite).